It's time for the last of the easiest Cataclysm dungeons. After this, only the heroic dungeons introduced via patches remain, such as Hour of Twilight. I'll visit those instances as well at some point so we'll see if it's a good way to make gold. Before doing that, there's some older raid instaces that haven't been visited yet, and there's also a few more rare mount farming posts in the line. But for now, let's see how much gold you can make if you visit Halls of Origination on normal difficulty! This instance has lots of bosses, but not that many trash mobs. Can you still make gold here? This instance is much like Grim Batol that was visited a few days ago. Because it's tuned for level 85 players, it's not as easy as you would think. If you're not a tank, then you can't pull the instance with 3 pulls most likely. However, a hard dungeon means better loot, right? If you're wearing a Cata reputation tabard, this is one of the instances that gives you reputation when killing monsters here, like all level 85 instances. Useful if you're after exalted achievements. When clearing Cataclysm dungeons, it's wise to drink a Potion of Treasure Finding to get more loot. When used, each monster has a chance of dropping a Tiny Treasure Chest which contains gold and other trade goods. There's a large stone obelisk after the first set of stairs and offers the Map of the Architects quest for archaeologists. If you have one Tol'vir Hieroglyphic, you'll get the Map of the Architects buff that increases your movement speed by 20%, allowing you to clear this instance faster, and thus make more gold per hour. Keep in mind that you lose the buff if you go out to reset the instance. instance on the zone map. There's not much to tell about this instance. There's no special tactics or anything involved. If you're a Death Knight, there's some undead mobs you can control in the sandy parts of the instance, but you'll lose them if you use the teleport. You can, however run back instead of using the teleport. I cleared all mobs and bosses. Here's the loot I received. This run took approx 18 minutes without the speed buff. After opening the chests, disenchanting greenies, selling the blues, the total amount of gold obtained was: 325 gold + another 300 gold from the blue. At least on my realm it's a very bad idea to disenchant blues. A sword may sell for 30g to a vendor, yet give you a shard worth 1 gold when de'd. Overall it's not an impressive amount, but Cata blues sell fast and you almost always receive one per run. 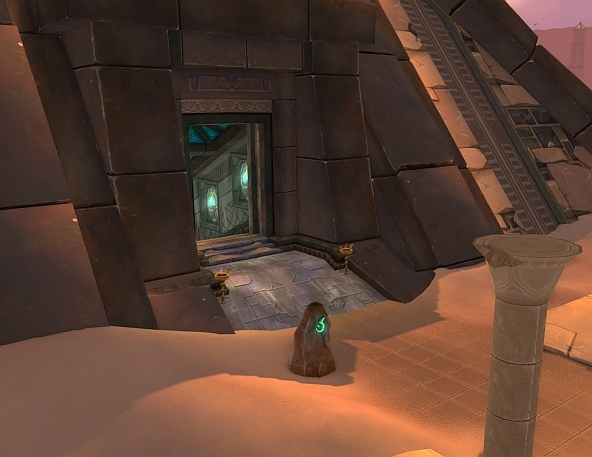 Tol'vir Hieroglyphics are (on most realms) still VERY valuable, with a global median price of just under 500 gold. Indeed they are! I wouldn't waste it on a 20% speed boost myself, unless it would last for more than one run.